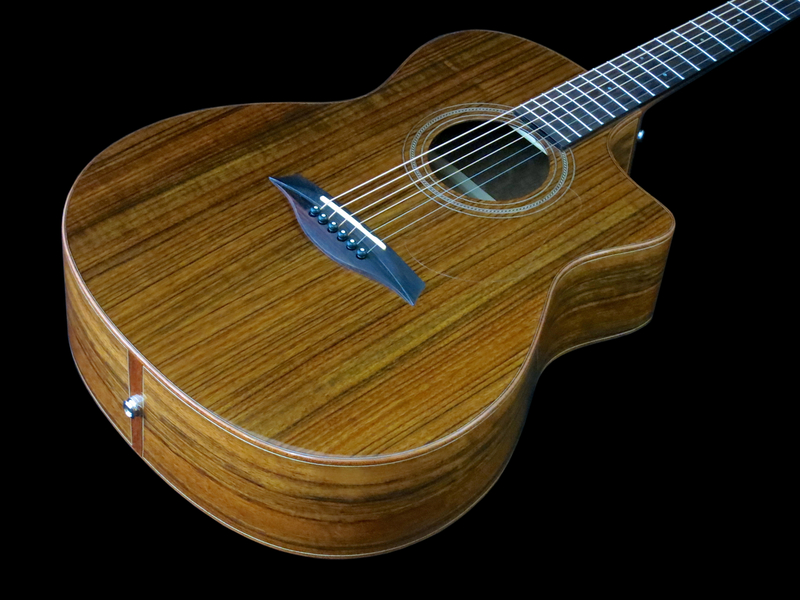 Most of you will not have heard of Mayson Guitars, yet. 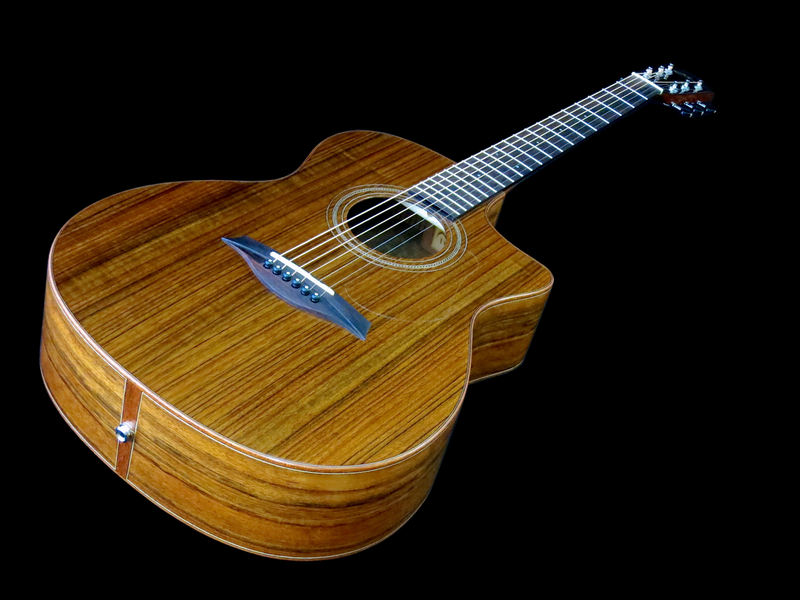 I’d guess this will change soon, because this ambitious Chinese acoustic guitar maker is not content with simply copying other people’s designs and building techniques. 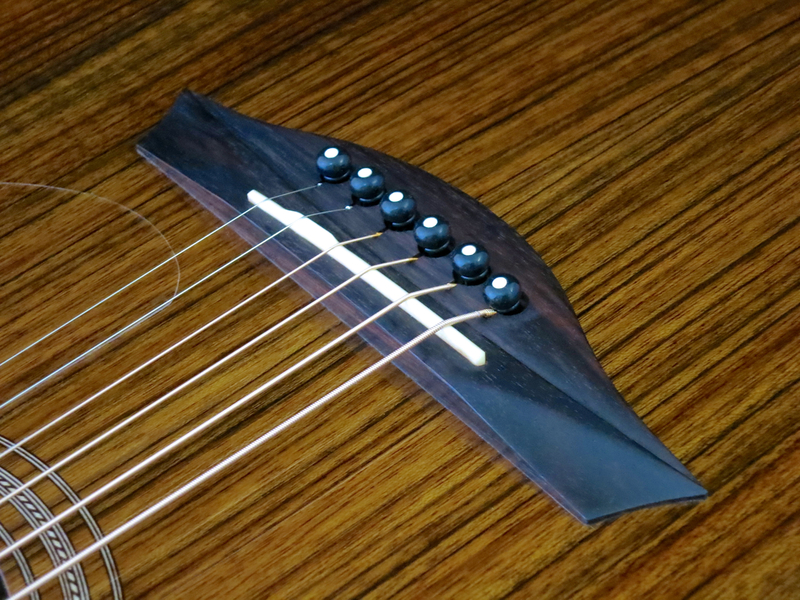 Mayson’s chief designer Alex Wang has come up with many structural improvements and updated manufacturing methods to make a better steel-string guitar. 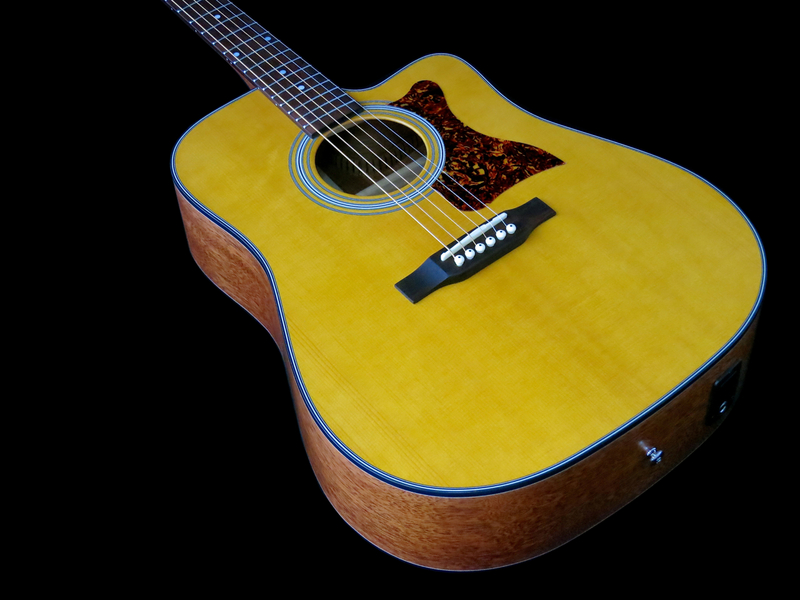 Key changes include Mayson’s patented bolt-on neck joint, their own special top bracing pattern, and deeper bodies for a richer sound. 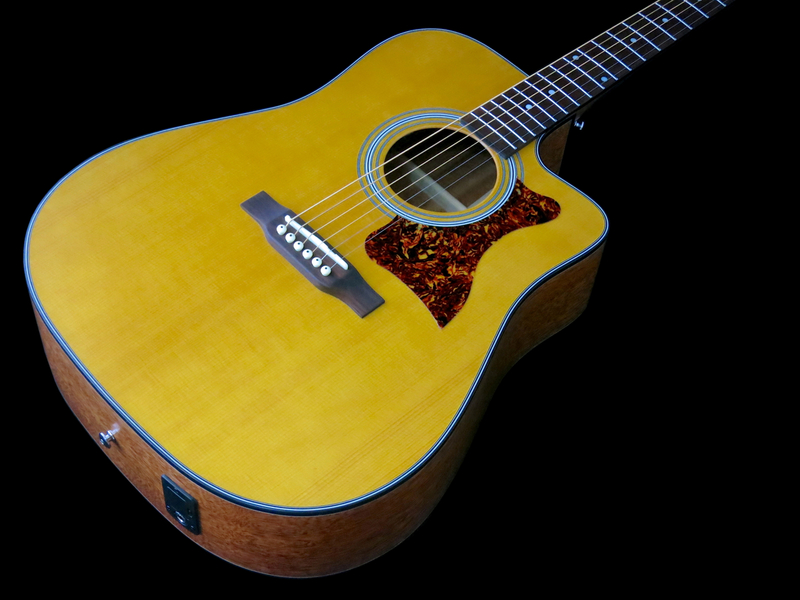 Mayson Guitars’ Finnish distributor NordSound kindly supplied us with a Mayson M3/OCE for this review. 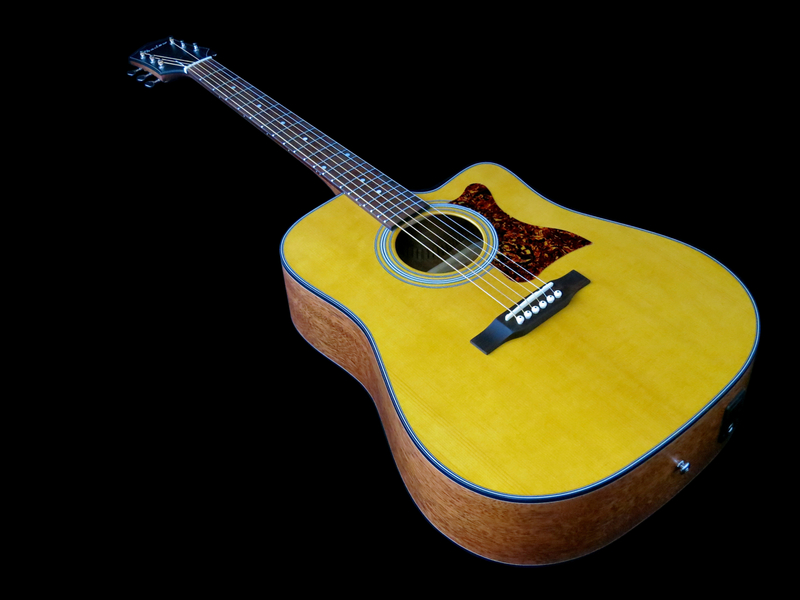 The Mayson M3/OCE (price in Finland: 558 €; incl. 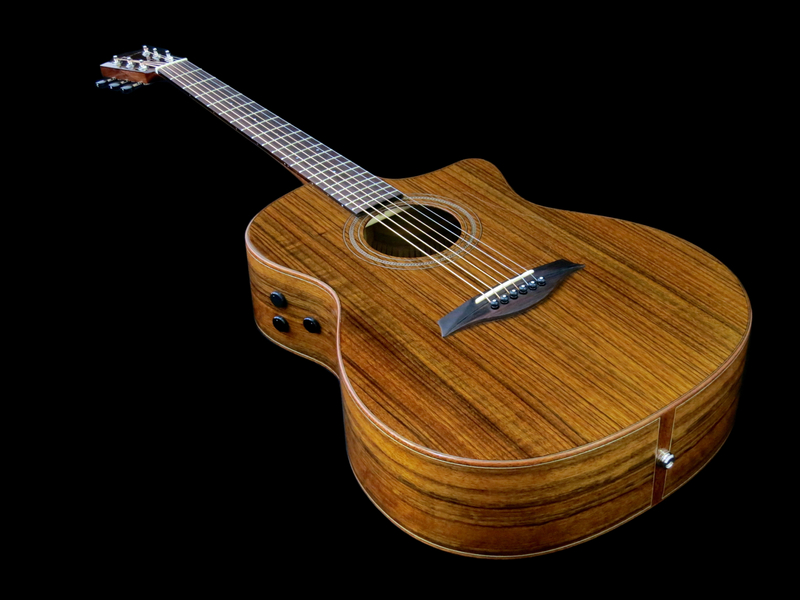 gig bag) comes from the company’s Luthier Series and is a Mayson Marquis-sized (Grand Auditorium) cutaway model with a built-in pickup and preamp system. 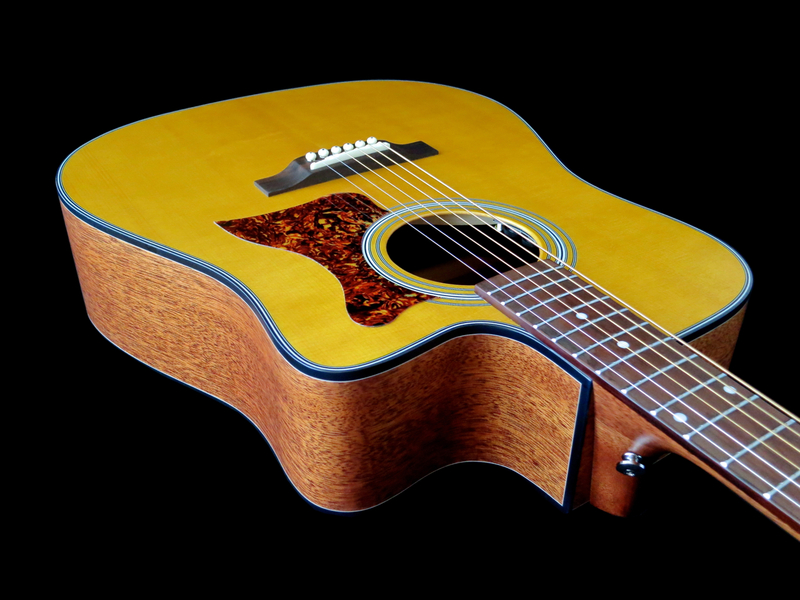 The M3/OCE is an extremely beautiful steel-string with a richly grained solid ovangkol top, and laminated ovangkol sides and back. 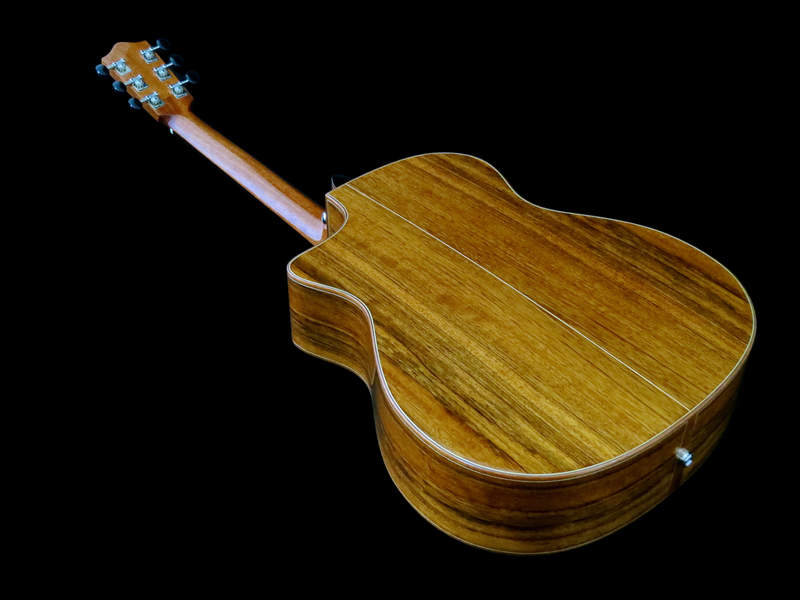 Ovangkol is a non-endangered African relative of rosewood. 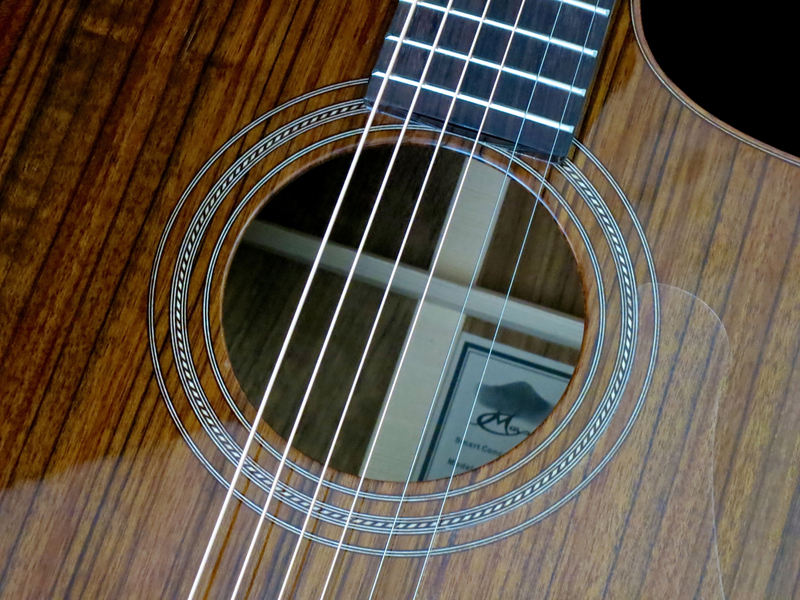 The Mayson’s neck is crafted from mahogany and topped with an Indian rosewood fingerboard sporting narrow frets. 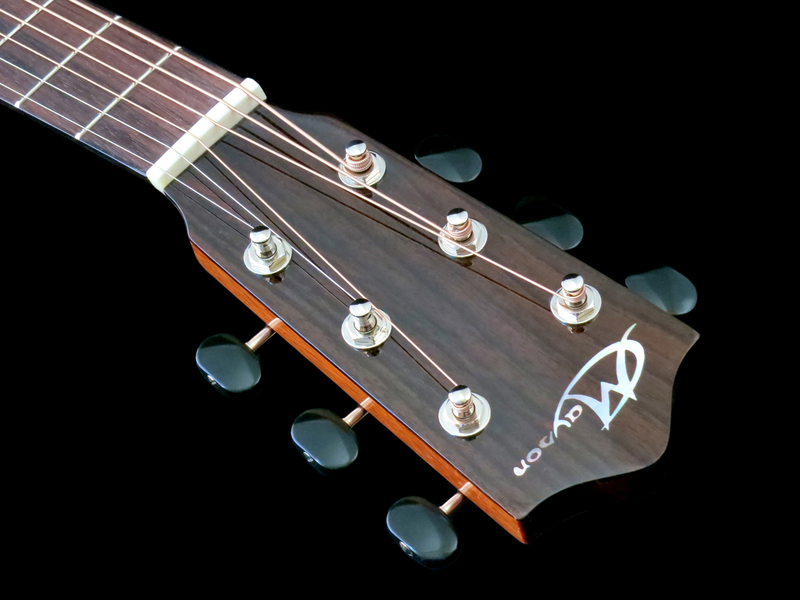 Mayson uses its own special style of open gear machine heads. 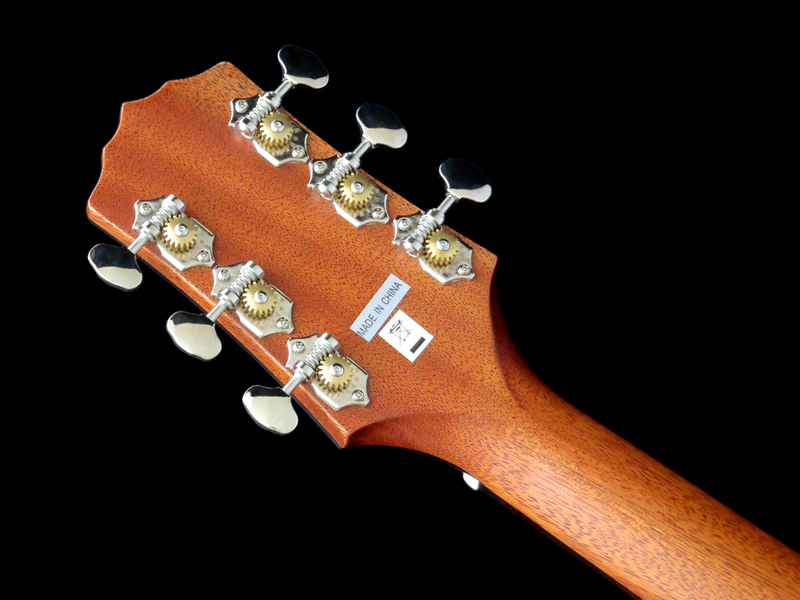 The tuners are sunk into the back of the headstock to prevent any sideways movement of the machine heads. 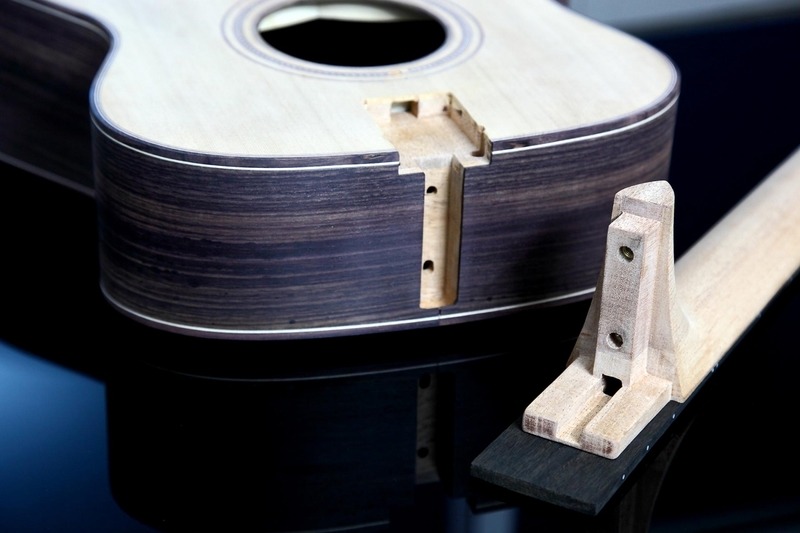 The M3/OCE comes with a top nut and a compensated bridge saddle both made from genuine bone. 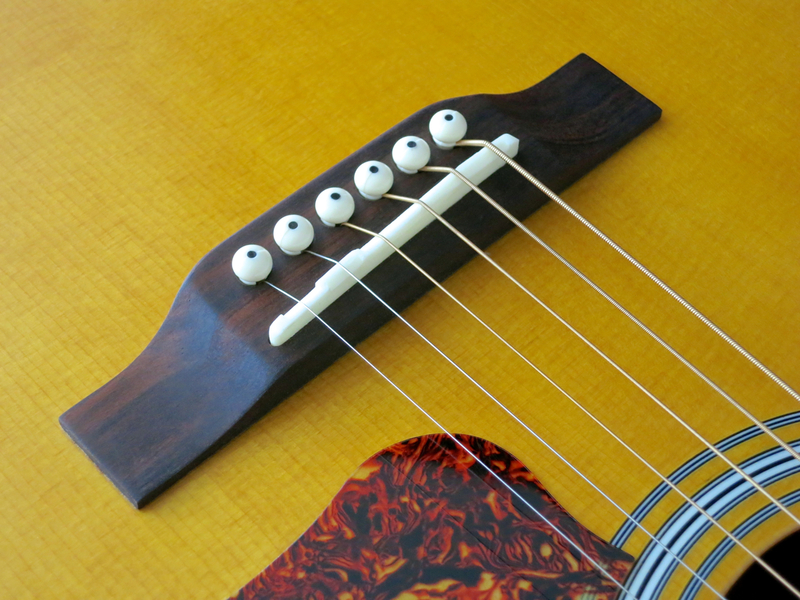 Our review instrument comes with Mayson’s own MPC-6 Purecoustics pickup system. 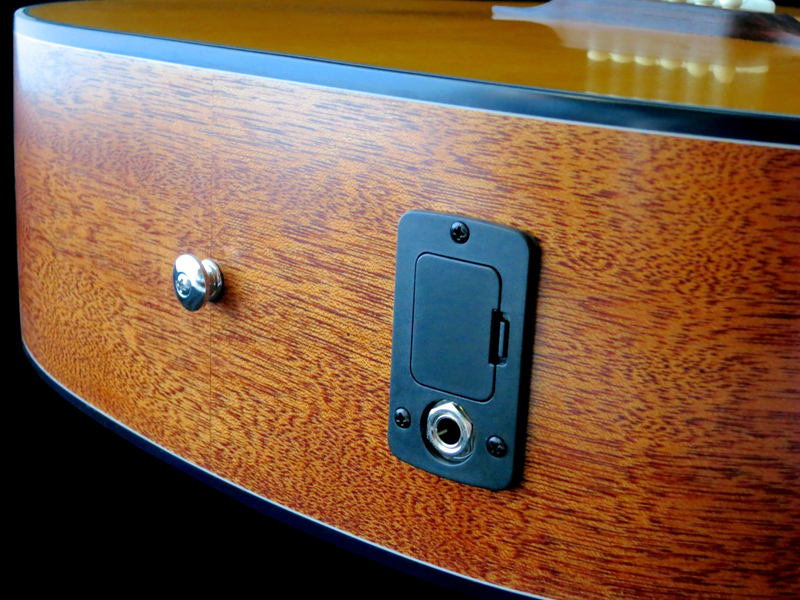 The preamp offers you three unobtrusive knobs to adjust your sound – volume, bass and treble. The only point deduction comes in the guise of a freewheeling battery pouch. 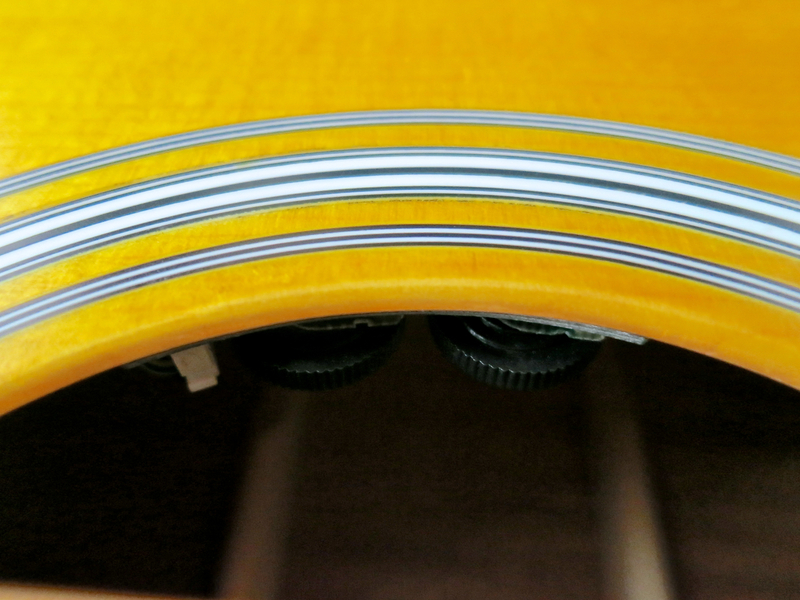 The sticky tape holding the velcro supposed to hold the battery pouch in place (next to the neck block) has become unstuck somewhere down the line, leaving the battery hanging from the preamp by its connecting cables. 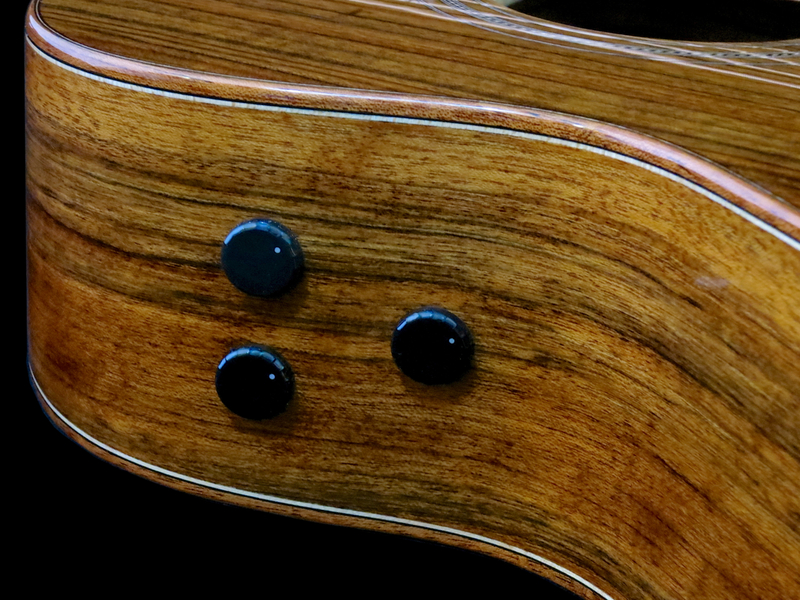 The M3/OCE comes adorned in tasteful wood binding. 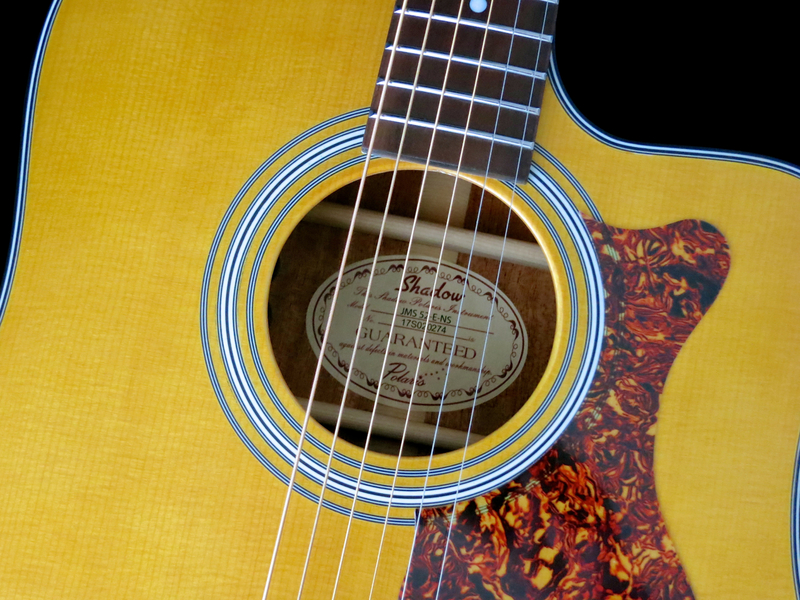 The guitar has received a flawless natural gloss finish. 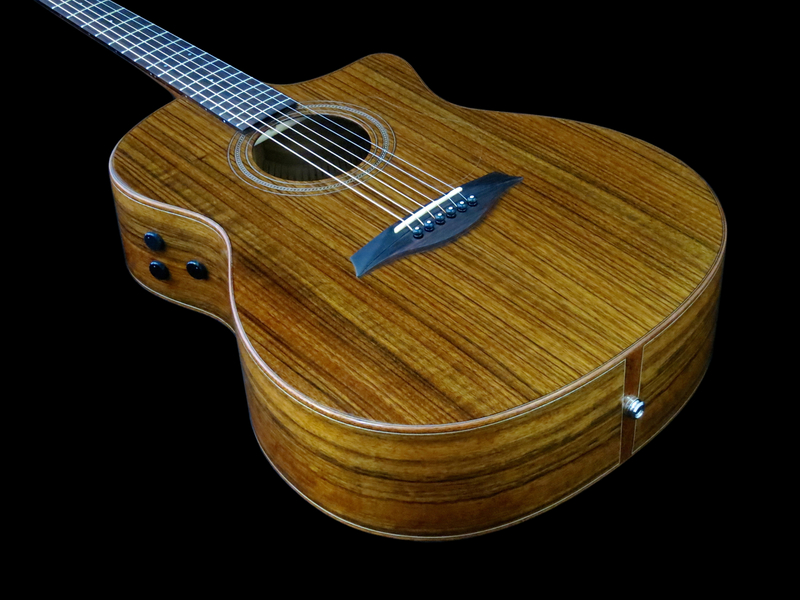 I’m a real sucker for beautiful woods, so the Mayson M3 got me on its side straight away, thanks to its stunning ovangkol soundbox. But the M3/OCE isn’t only looks! 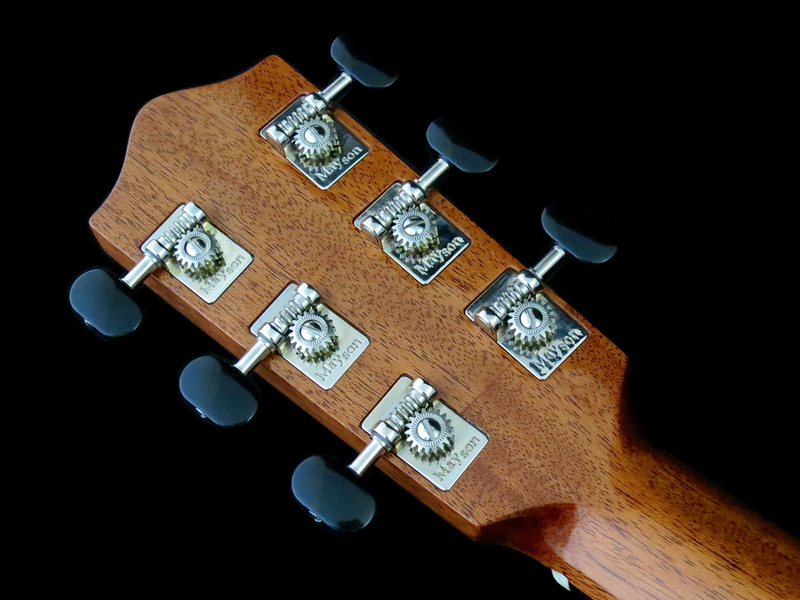 This guitar plays great, not least thanks to its comfortable D-profile neck, and a very decent fret job. 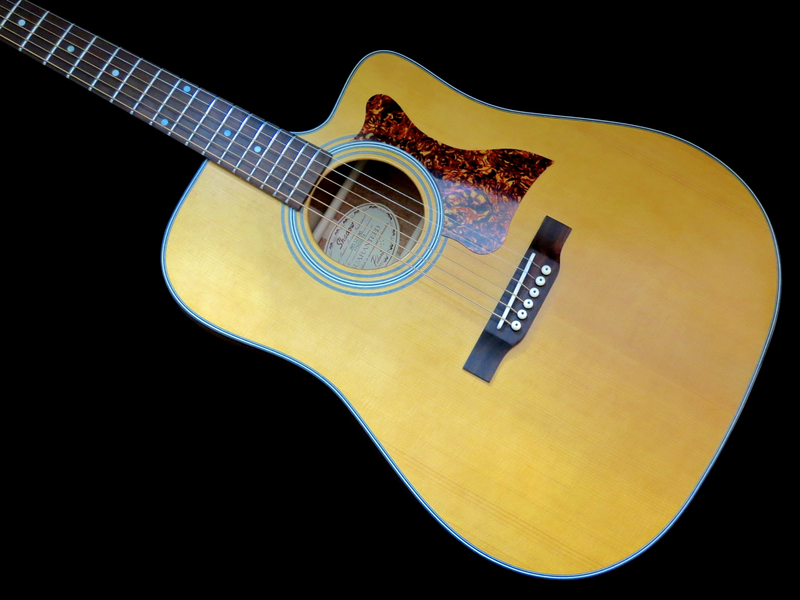 In my view, the best thing about this Mayson is the way it sounds, though. 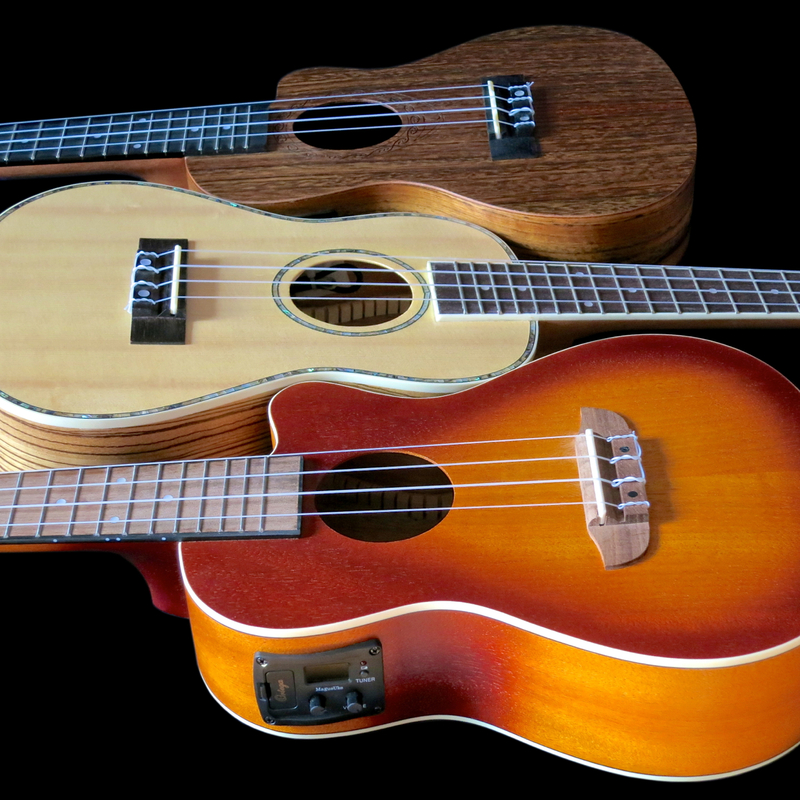 The sound is rich, well-defined, and offers plenty of zing and sparkle. This is a huge sound with fantastic definition, which reminds me of a grand piano. 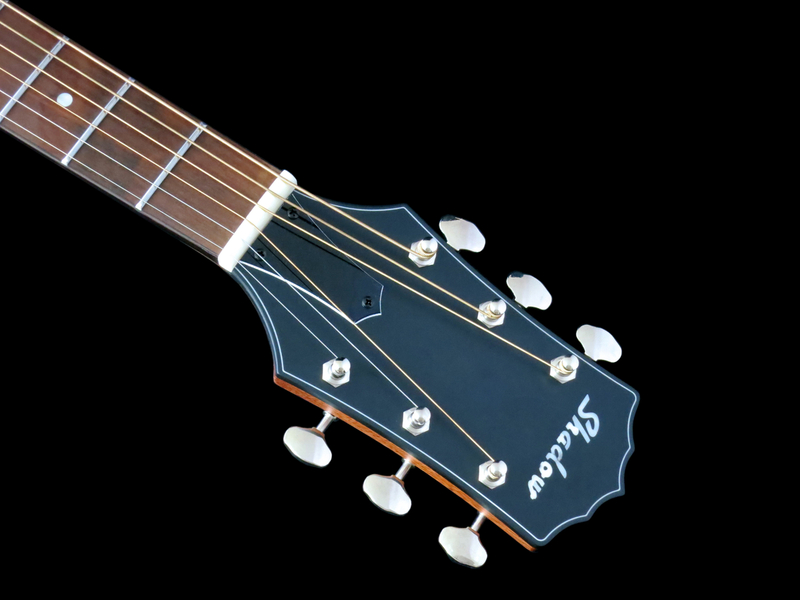 Mayson’s MPC-6 Purecoustics pickup system also ticks all the right boxes in my opinion, giving you a very decent piezo version of the M3/OCE’s acoustic voice. 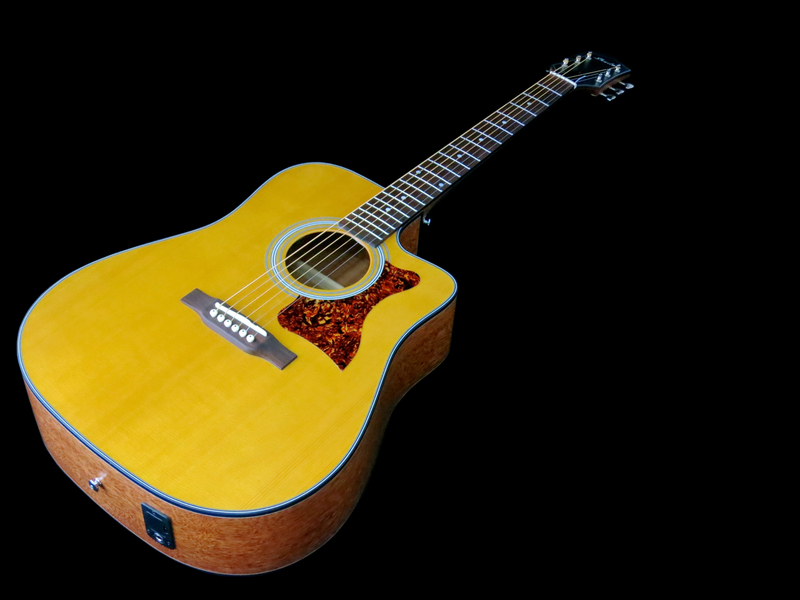 The Mayson M3/OCE is a fine acoustic guitar with a very decent pickup system at a very fair price. 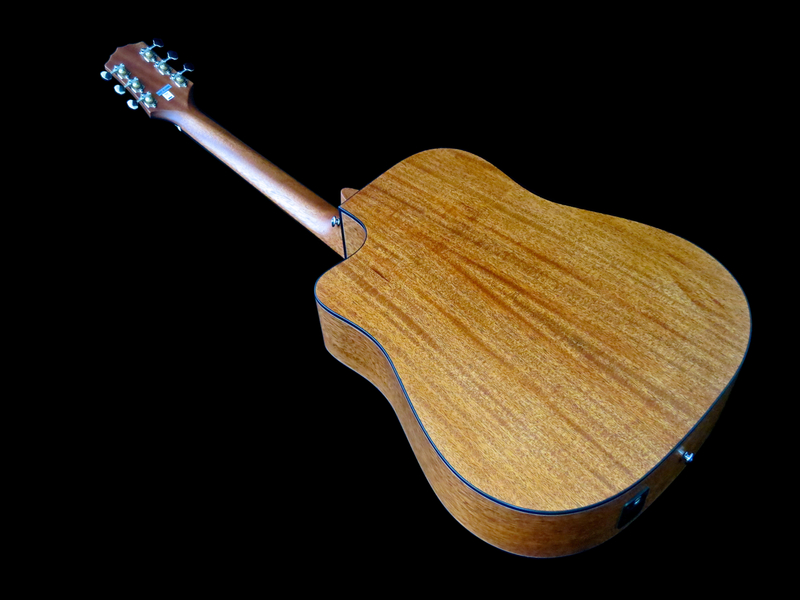 The ovangkol soundbox makes this guitar a real thing of beauty. I can only recommend you try one out for yourself.